The course aims to provide a gentle but thorough introduction to composite materials - how they work, how they are made, what they are used for, and what advantages (and disadvantages) they can bring. This includes a number of "hands-on" sessions in which delegates will mould simple components under the guidance of our experienced staff using a variety of different production techniques. By the end of the course, all attendees will understand the basics of what a composite material is, what ingredients go into making a composite and how composite materials are converted into finished parts. Introductions to wider aspects such as market segments, repair and design are also covered. The course is suitable for anyone that is looking for a comprehensive introduction to composite materials. This includes, for example, designers who are familiar with metals but who want to understand how composites differ, new starters in the composites industry, existing composites staff in non-technical roles (e.g. sales, marketing, human resources, etc.) who want to learn the "language" of composites so they can communicate more effectively with colleagues and customers, and interested outsiders who would like to learn more about the composites industry and the opportunities it provides. The practical hands-on sessions provide an excellent means of reinforcing the classroom content by putting theory into practice. The course assumes no prior knowledge of composites, nor necessarily any scientific or technical background. The modular structure of the training allows us to start with the very basics, and then build upon that foundation to a level of detail appropriate to the audience. For the practical sessions, full personal protective equipment is provided. Hand lay-up is one of the most straightforward methods of producing a composite part. Delegates will lay-up a curved part using glass chopped strand mat and polyester resin. In doing so they will cover aspects such as tool preparation, gel-coats, resin cure, and techniques for properly wetting-out fibres with resin to reduce dry-spots and porosity. Prepreg compression moulding is used to produce high quality, high-performance parts. Delegates will lay-up a composite laminate from carbon-epoxy prepreg, which will then be consolidated in a heated press. Aspects covered include tool preparation, release films, the importance of orientation in lay-up, and heated cure cycles. Delegates will prepare a composite part for vacuum infusion, a process by which liquid resin is drawn through dry fibres by the application of a vacuum. This includes the use of peel plies, flow media, vacuum bags, sealants and vacuum pumps. Resin transfer moulding (RTM) is a closed-mould process in which liquid resin is pumped into a sealed, metal tool. 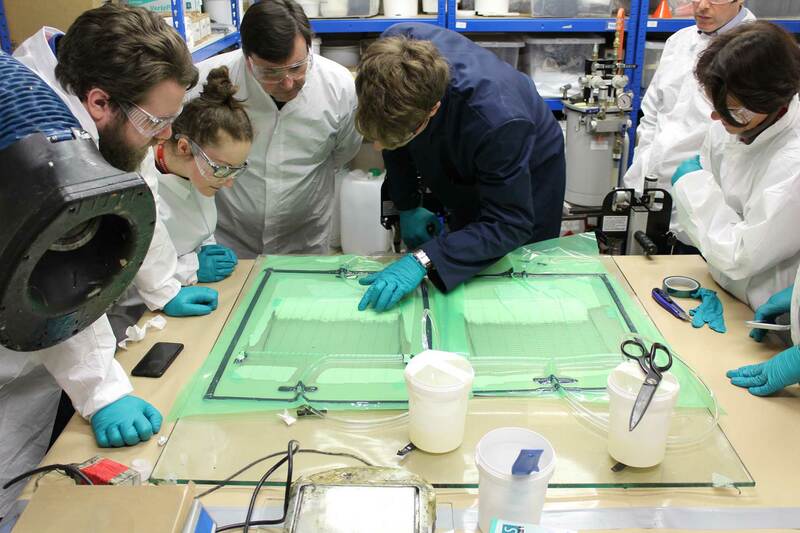 Delegates will manufacture a glass-reinforced epoxy laminate using RTM. Delegates will be shown two aspects of testing: (i) mechanical testing, such as tensile testing, flexural testing and impact testing, to determine the stiffness and strength of a composite part; and (ii) material characterisation techniques, such as dynamic mechanical analysis and differential scanning calorimetry, to determine key properties of resins such as cure characteristics and glass transition temperatures. Two-day course structured over 7 modules with practical elements. Average Rating: 4.66 from 29 reviews. 100% would recommend our training courses to a colleague and 96.55% rated this course with 4 or 5 stars. Wide overview of composite processes. Well organised = well done! Very good overview of many aspects of the process & materials, split in to easily understandable chunks. Explanation of all terminology was excellent. The [hands-on] experience of different processes was very useful and interesting. [Overall], the training was well paced with a clear delivery. Very informative and builds knowledge at a steady pace. Theory and practical combined in multi-industrial clients. Both practical and classroom [are] great for an introduction to composites. It's great to have "classroom lessons" as well as practical parts. A lot of sample were shown, also in the theoretical part. Pitched at a good level, good mix of classroom & practical - engaging, good handouts/notes. All presenters very knowledgable, friendly and approachable. They considered and answered all questions well. Thank you! Good overall training from beginner to advanced. Valuable content delivered well. The presenter's level of knowledge and ability to answer questions was brilliant, especially for the practical modules. A great approach to composites and basic understanding to it. Gives a good background and understanding of all aspects of composites. Very good all-round foundation. [Presenters were] very clear and patient. The training incorporates a good balance between practical and theory. The presenters has excellent delivery with careful consideration for questions. The content offers a good level of basic background and more in-depth theory and design. Thanks for the experience! It provides a good overview over composite materials, properties and production. A good introduction to composites. An interesting couple of days thank you! Excellent overview, highly relevant introduction to those new to the industry. Simple enough to give everyone a really useful overview of composites. Slides were very clear and well presented. Coming in from limited knowledge, I now feel confident in designing for manufacturing processes. Presenters were really nice, clear and knowledgeable. Overall really great, thanks! [This course] has training & practical [modules] and [demonstrates] different methods of manufacturing and a clean idea about different materials and [their] selection. Very good for people new to the industry.